Life In Argentina: Welcome to the Adventures for 2012! Welcome to the Adventures for 2012! Well it has been a very long time since updating the blog- we have been on some serious holidays and also so readjusting to the routine of starting work again after such awesome adventures back to our Australian home and exploring of Southern Argentina and Chile! So, since the final blog post for 2011, we have just had a super 8-10 weeks of summer vacation! Teaching is an incredible fulfilling profession with the huge perk of amazing recoup/rest period with the opportunity to explore the world. This is our goal over the next couple of years and Chris and I are so so keen to take full advantage of that this year! What an opportunity we have to travel travel travel during the holidays we get! As my awesome mother in law would say, we are "tick tick ticking" the many wonderful countries and things to do off our list- it's just fabulous! Young people out there- don't settle down just yet- there is a world of opportunities, work options, skills to develop and harness, amazing cultures and people to meet and learn from and love, nature of extreme beauty and craftsmanship to behold and a restlessness that will be quenched- get out of our comfy bubbles and see this world. So the story of holiday adventures begins with heading to Australia for the wedding of my brother in law. A VERY beautiful, natural and genuine event of love, family community, Jesus and festivities by the sea- truly lovely! We then had christmas with our families and also a day to ourselves (chris and I had alone time) with just our own families- only the Prouts altogether (my mum, dad, my sister and I) and Chris went off to have his big extended family annual christmas event. This was a very special day for me and I don't think we will have a day like this again for a long time. Just the four of us, mum & dad with their two girls- the day was scuba diving and a picnic by the sea, ending with a home cooked meal and a honest and open chat over dinner- just the four of us. I won't forget this fantastic day with my wonderful parents and my gorgeous sister! I'm so blessed to be born into this family! Sydney Harbour- my 25th Birthday! New Years Eve was next which was an event also to never forget- mum and dad had booked a room with a view of the Sydney Opera House and Bridge... absolutely rare and once in a life time and it was a blast!! late night dinner with a bang! Always the fireworks are such a show and to be in that place at that moment was just insane... how spoilt are we!! I don't know how quite to feel about it- but the wealth and blessing of this just makes me not sure how to write it out right without feeling like a spoilt kid... it was a magical night! To end the trip, I turned 25- and had a hoot of a party with family and close friends. We ate sooo much amazing fresh seafood with my brothers and sister- cooking and eating all day long. I think celebrated with Chris' family and my friends from the coast doing a 'master chef' themed party- with mystery bags of ingredients and a crazy frantic fun cook up and eating festival- the food monster in me was clearly easy to see at this party- thanks everyone for making my bday such a memory of fun and food!! what a blast! And then after a month of Australia it was heading home to Argentina- and in a way, we both felt ready for this. Ready to be back in the home we had made over here- our space with our friends here in Quilmes. But over the last month being back I have felt a real pull in my heart for my family and my beaches and my sunny Australia. I haven't missed being away from there this much ever... I am hoping the busyness of work now will keep me occupied. I know this blog update is long- but wait.. there is more- the adventures continued! We arrived back to Argentina mid January and had a week to fight the jet lag and chill out in Buenos Aires (which was sooo stinking hot!! oh my goodness- if you are thinking of travelling BA in summer- forget it!! the hot humid unrelenting heat is a killer)! We had book flights and planned a backpacking trip down to Southern Argentina- Patagonia! We escaped the heat and switched from swimwear and thongs (flip flops) to beanies, scarves, fleece jackets and hiking boots. 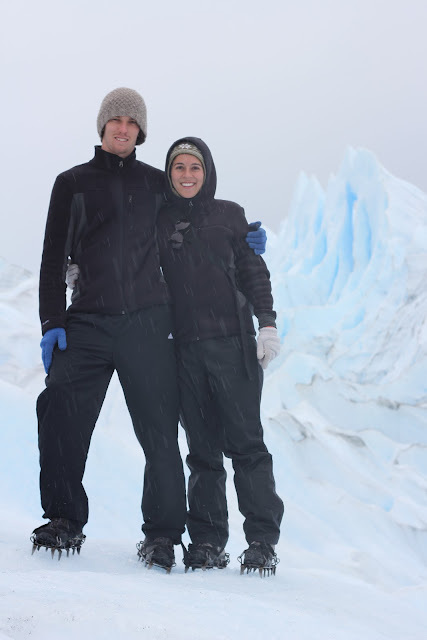 El Calafate in Patagonia was the first hotspot on our 10 day trip, where we hiked on the famous glacier Perito Moreno. IT WAS INCREDIBLE! and was just such a natural wonder I don't know how to quite explain all the sensations and experience. It was just completely awesome and natural and a marvel! You could hear it cracking and see the large chunks falling and crashing into the aqua blue water. The colour of the ice reflected this eery amazing blue colour and it was just fascinating!! Moving on from that- we ate some of the most amazing lamb I have ever had! slow cooked over hot coals for hours, it was crispy crackly melt in your mouth amazingness! Go for the lamb! Ice Trekking on Perito Moreno Glacier- Unreal Experience! Horse Riding in El Chalten- Superb and breath taking! We also caught a bus south of El Calafate to Chile's national park 'Torres del Paine' and camped there for 2 nights. We walked a good full day hike up to the top where the 3 huge rock towers and glacier were, it was so beautiful and the camping was just so natural and wonderful!!! Usually people stay 7 days and hike the whole national park, but we didn't have the time or the want to do that and just loved how we spent our time over this whole trip. Our final destination was Rio Gallegos, which we caught a bus to and stayed with a very special and generous family connected with our school. The invited to stay with them last year and we took them up on their offer. It was a very big honour to be invited and to be shown such amazing hospitality. These beautiful people allowed us to see what their life was like on their estancia (Argentina Farm) of sheep and we enjoyed every minute with these wonderful people. We made new friends and just feel so blessed to have been able to experience the end of our trip in Patagonia this way. Chris and I now have the travel bug like never before- we have been hunting down flights to Brazil and are planning to reserve them tomorrow, paying for them on Monday! ooo I will share these travel ideas soon!! We also have Machu Picchu coming up in 2 months!!! all signed, sealed, delivered, it is just a matter of getting on that plane in April and a way we go on the Inca Trek!! We also have our beautiful cousin Miriam coming to stay with us this week. Our first visit from a young family and special friend! Sooo looking forward to showing her our town and giving her a taste of the fun Buenos Aires has to offer! It is really good being back- There is a super full year ahead- I can't believe a year of living abroad here in Argentina is down! How quick did that time fly?! I also just want to send my love and hugs to Mama and Gidhi (my beautiful grandparents) I have been meaning to call so many times and will do soon!! But I want to say how much I love you both and how lucky I am to have such caring people who have shaped who I am and the way I see the world. Thank you for loving me Mama and Gidhi! And this little message goes out to my super hip Nanna and Grandy who I know are reading from their computer and are now so with-it using skype and everything!! Thankyou for my super generous birthday present- It made out holiday in Patagonia so amazing!! It gave us the gift of Ice Trekking on that incredible glacier you can see in the photos!!! I love love love you Nanna and will call soon, I promise! So here is to hopefully getting back into recent blog updating because life here is very different to just the grind and comfort of being home. I love that our weekends at the moment have been just lounging at home, or riding our bikes to the park with mate (mah-teh) with our spanish study books or at the pool or spending time catching up with our beautiful friends. love love everyone and happy new year- get out there and meet people around your and embrace the skills your have to make a difference, help people who need it, love those who you struggle to love and be blessed because you were created for more. I miss you and love you and thanks for sharing these experiences with me by reading them and encouraging me for it. I'm so blessed to have you as my friend. God bless so much, we think about you guys all the time and i'm sending prayers up right now for you and Mike and your two super cute chicos to be safe and fulfilled in His Spirit. That is truly brilliant Sis. Your passion and love for life and the world make me want to quit my job and hit the road. Your adventures are inspiring and each time you write the travelling itch gets stronger in me again. Love it all. I want some.